This show has been particularly inspirational for me, not just due to the incredible quality of the work, but because much of it gave me context and inspiration for my own practice. Use of light and shadow within my work, as well as sensory experience is something that has been suggested to me by a number of people, and it’s an idea that I’m curious about developing. I found food for thought in all of the pieces in the ‘Light Show’, but there were several that have kept me thinking and coming back to them. 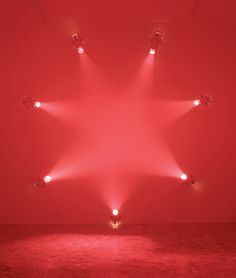 Ann Veronica Janssens “Rose” (2007) struck me with it’s use of saturated colour, misting and light creating an ephemeral geometric sculpture in mid-air, the shape of which only becomes apparent from certain angles. 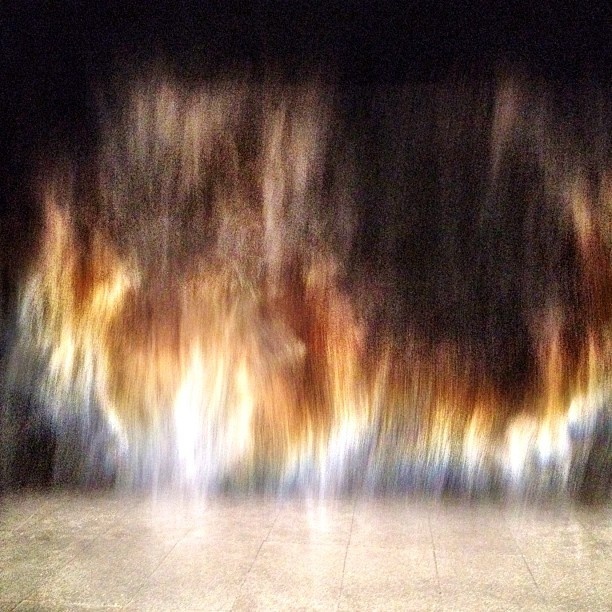 I loved the way a seemingly volumetric object was created out of smoke and light, and the way the ‘solid’ shape could be walked through and interacted with. 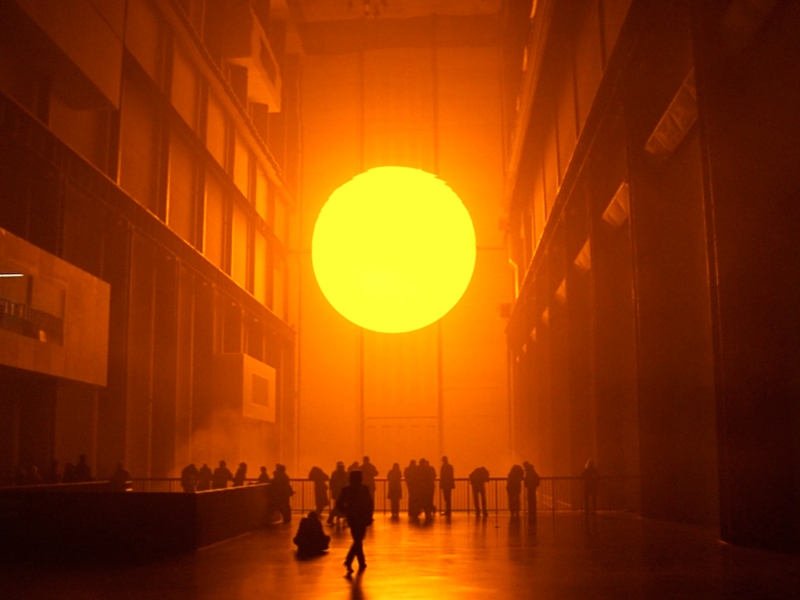 Anthony McCall’s “You and I Horizontal” (2006) captivated me for similar reasons. It had similar qualities of solidly created from ephemeral substances and it also contained movement which led to the work changing over time. This work encouraged even more participation from the viewer to actually stand and move within the sculpture itself and affect the very form of the work. 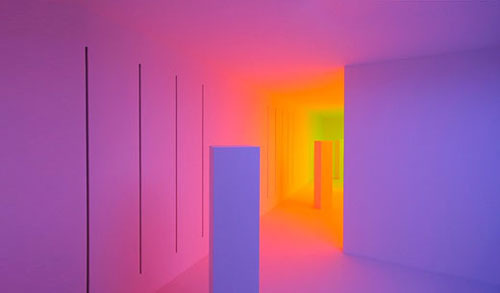 Another work that I spent a lot of time with was Carlos Cruz-Diez’s work “Chromosaturation” (2008). 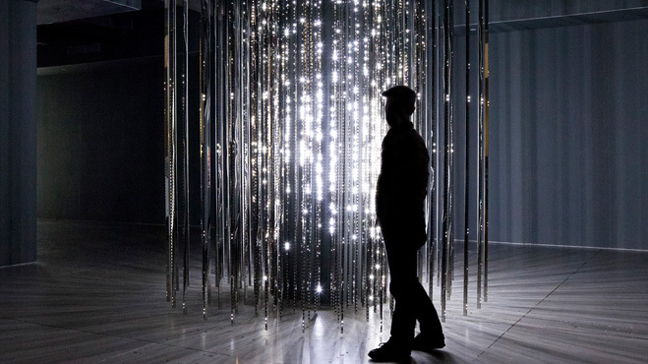 This one interested me for it’s immersive environment and they effect it has on the viewer who spends time within it. The intensity of the colours, the shifts between them and shapes inside the environment all serve to create a kind of, not unpleasant, disorientation in the viewer. I have been interested in investigating creation works that use environments to create responses in viewers through stimulation of various senses and this was a perfect example of the way intense colour works. 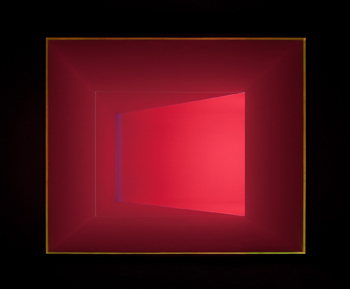 One of my favourite pieces for it’s subtlety and unexpectedness was James Turrell’s “Wedgework V” (1974). The passage into the work through the pitch black, having to be led by an usher, was a disquieting but quite exciting experience. On entering the work’s viewing area and sitting down to let my eyes adjust I initially thought I was looking at a screen and was waiting for something to happen. The space beyond the threshold was entirely unexpected! The feeling I got from placing my arm beyond the frame was akin to mild vertigo and I was transfixed by the effect the work had on my perception of space: even though I *knew* what the work was physically, my eyes and brain couldn’t reconcile it which left me feeling slightly off-balance. Olaf Eliasson’s featured work “Model for a Timeless Garden”, 2011 was a captivating piece, but researching him I discovered several other works that I would have loved to have seen and that fit a bit more into my area of interest. ‘Beauty’ (1993) uses a soft curtain of water droplets illuminated by spotlights to create the temporary vision of a rainbow from a certain point in the room. The elements I love about this work are similar to those in Ann Veronica Janssens “Rose” (2007); the way the image or object is created from something so transient and weightless, the way the image is only visible from certain points, while the work as a whole can be seen form multiple angles, the fragile yet impactful nature of the work. “The Weather Project” (2003) Tate Modern Turbine Hall, deals with colour saturation and it’s effect on the viewer in a similar vein to Carlos Cruz-Diez’s “Chromosaturation” (2008) but on and even grader scale and with only one light frequency, the added texture of mist and a reflective ceiling. I would love to experience this piece! 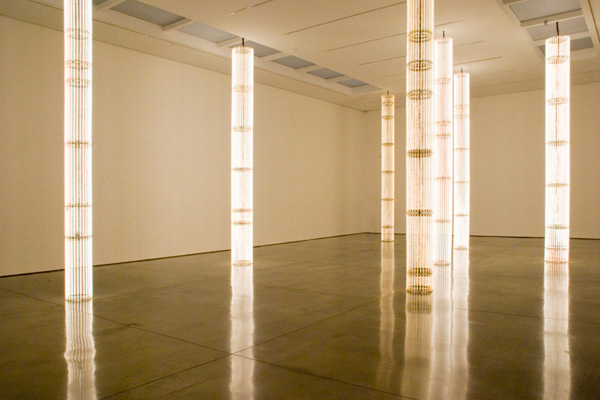 Two final pieces are worth including here due to the movement and transformation experienced while watching the works; Leo Villarreal’s “Cylinder II” (2012) and Cerith Wyn Evans “S=U=P=E=R=S=T=R=U=C=T=U=R=E (‘Trace me back to some loud, shallow, chill, underlying motive’s overspill…’) (2010). While “Cylinder II” is like a cold, twinkling starscape in the midst of a vast ocean or galaxy, “S=U=P=E=R=S=T=R=U=C=T=U=R=E” pulses with life and radiates vast amounts of heat. Both works seemed alive, possibly sentient, and they really inhabited the space they were installed within like great, living creatures. While “Cylinder II” sparkled and flared, “S=U=P=E=R=S=T=R=U=C=T=U=R=E” breathed and pulsed with huge, hot sighs. Lauson, C. (2013) Light Show. MIT Press. Cambridge: USA. Posted on 11/24/2014 11/24/2014 by marymacgregorreidPosted in Contemporary Art PracticeTagged contemporary art, Ephemeral, Light. Great post Mary! I felt as though you took me through the exhibition I could see it through your eyes and perception. How did you feel when you saw the show in real life? Did you enjoy the same works that I did? Which struck you the most?